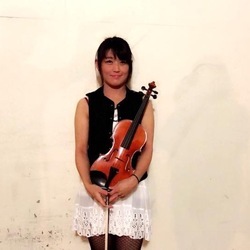 Rei Luu, violin, has received her Masters and Bachelors in music performance from CSU Sacramento, where she was a member of Ian Swensen's studio. A native of Santa Barbara, she began her violin studies with Barbara Coventry at age four, and went on to study with Nina Bodnar, Gilles Apap, and Mary Beth Woodruff. Rei has studied orchestra, chamber music, and solo repertoire from a young age at the Music and Arts Conservatory of Santa Barbara. She is a two-time recipient of the AJ and Susana Watson Chamber Music Award as well as the first prize winner of the CSUS Concerto Competition, and the recipient of many scholarships and awards. She has attended several music festivals over the past years, including the International Summer Academy at the  Mozarteum in Salzburg, Sierra Summer Festival, New York University Quartet Intensive Program, and most recently, the Orchestral Institute of Napa Valley where she had the opportunity to study with members of the Russian National Orchestra. Currently, Rei is an active member of many orchestras and chamber groups around the Northern Californian area.